World's Deadliest Volcanoes. World's Scariest Police Shootouts. Prisoners Out of Control. Real Vampires Revealed. Reading the long list of Scooter Pietsch's credits makes "TV composer" sound like one dangerous profession. It is, Pietsch confirms, though natural disasters, violent criminals, and the undead are the least of his problems. "The schedules are extremely difficult. The personalities involved can be very trying. You always have to be personable and positive, even when people are calling to demand the sort of changes that produce a barrage of cussing as soon as you hang up the phone." Speed is the name of the game, and the 02R96's automation lets us turn everything around very quickly. And the reality shows that have become Pietsch's specialty are the hardest gigs in the business. "They typically have 44 minutes of score for every one-hour episode," he explains. "There's a one-week turnaround per episode, which means only four workdays for me. That translates to over ten minutes of new music per day, recorded and mixed. You have to know your equipment extremely well to produce music that quickly." 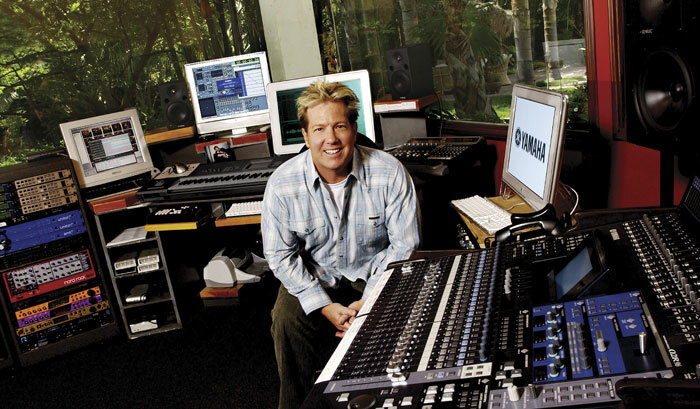 Pietsch credits his Yamaha 02R96 mixing board with optimizing his studio workflow. "Speed is the name of the game, and the 02R's automation lets us turn everything around very quickly. Since we switched to that board, we have every synth and sampler in my studio wired directly into the desk. we have the 02R's onboard compressors and limiters engaged at all times, and certain channels are always set up the same way, with permanent EQ and compression settings for particular sounds. My string and brass samples, for example, all have regular settings, because it slows you down if you have to, say, search for a new string sound every time you write a piece." Another indispensable tool is a Yamaha Motif synthesizer. "I don't keep many hardware synthesizers around anymore, but the Motif is an exception," says Scooter. "I love it. It has very contemporary sounds that are different and unusual, and I always manage to find something unique on it. I tend to use it as an 'ear candy' instrument when I'm looking for the one element that will really distinguish a piece. It's great for that little unexpected sparkle." Scooter, a guitarist and keyboardist, says he didn't originally set out to be a TV composer. "I started out to be a rock star," he laughs. "But somewhere along the way, people started offering me money for scoring projects, and once you get the bug for making money from your writing, it's easy to get used to that sort of satisfying payoff, as opposed to making rock 'n' roll records, which is such a speculative venture." Fees vary immensely, explains Pietsch, depending on the size of the network, the generosity of the production company, and the composer's track record. "A one-hour show on a small cable channel can pay as little as $1,500, though $2,500 is more common. Network reality shows pay more, and a few hit drama shows might pay as much as $17,000 per one-hour episode." Pietsch has a tip for composers with talent but few credits or connections: "everyone sends tapes to big executives and producers, but I don't think that's the best tactic. Every producer's desk is covered with 1,000 problems on any given show. If they can go with a composer they know, that's one less problem. Trying out someone new is something they have to continue to worry about. A better tactic would be to send your music to composers who are doing a lot of work. Because when composers get really busy, they sometimes use other composers. It may sound strange going to your competition for work, but I actually believe it's a better move." While Pietsch boasts traditional classical skills and a Masters degree in composition, he points out that some successful composers don't even read music. "The quality of the music is the most important thing," he says. "But the thing that would shock most people is just how fast, proficient and good the composers and technicians who do this work are. People often think that luck is involved or that there's some secret they don't know. But what it really comes down to is this: The people who get the work are the ones who have spent a lot of time in the studio getting really good at using their equipment. It's a hard job, man."